Americans who think global warming is happening outnumber those who think it isn’t by more than 5 to 1. 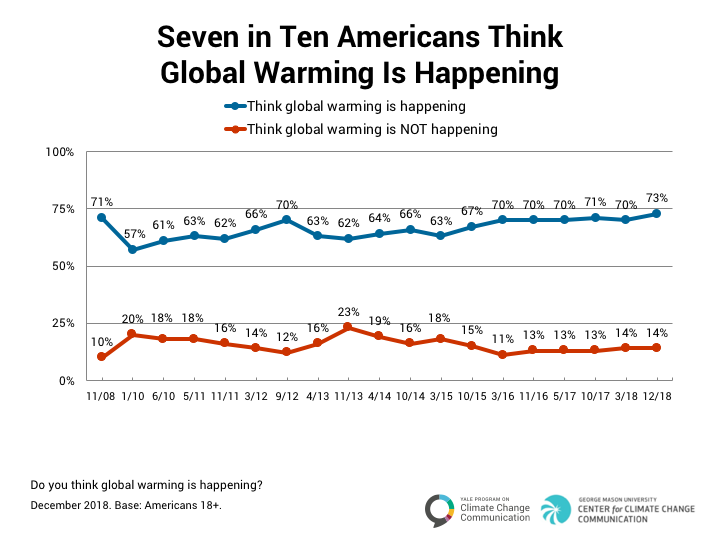 About seven in ten Americans (73%) think global warming is happening, the highest percentage since our surveys began in 2008. By contrast, only about one in seven Americans (14%) think global warming is not happening. 1.2. 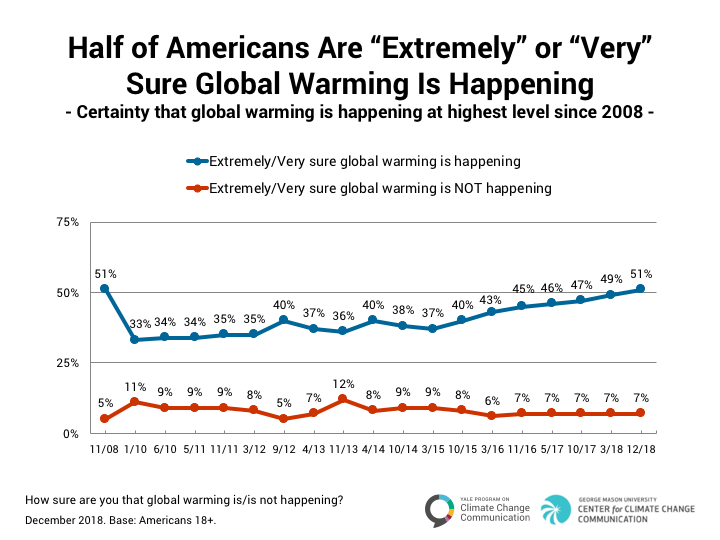 Half of Americans are “extremely” or “very” sure global warming is happening. Fewer than one in ten are as sure it isn’t happening. Fifty-one percent of Americans are either “extremely” or “very” sure global warming is happening. Far fewer – 7% – are “extremely” or “very sure” global warming isn’t happening. The percentage who are sure global warming is happening has risen steadily over the past three years and now matches the highest level since our surveys began in 2008. 1.3. 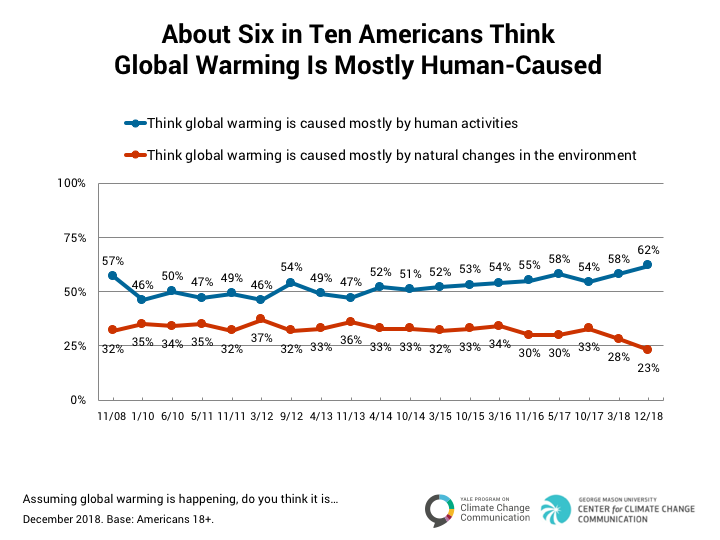 About six in ten Americans think global warming is mostly human-caused. A majority of Americans (62%) understand that global warming is mostly human-caused, the highest level since our surveys began in 2008. By contrast, about one in four (23%) say it is due mostly to natural changes in the environment, the lowest level since our surveys began. 1.4. 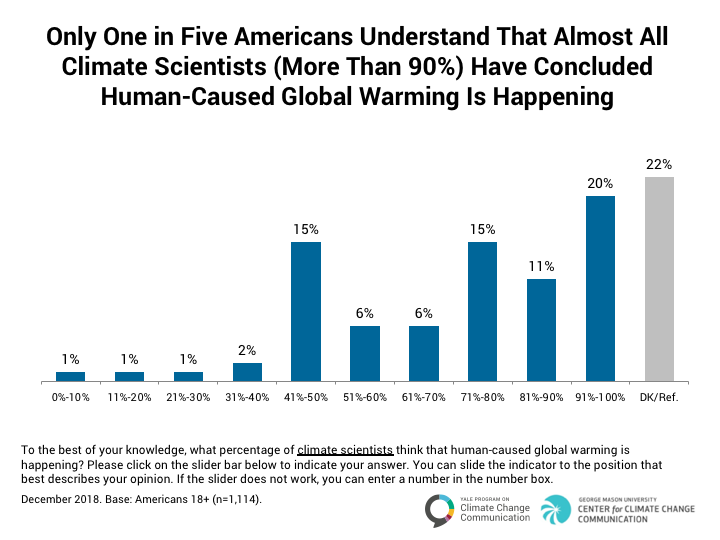 More than half of Americans understand that most scientists agree global warming is happening. A review by John Cook and colleaguesCook, J., Oreskes, N., Doran, P. T., Anderegg, W. R. I., Verheggen, B., Maibach, E. W., Carlton, J. S., Lewandowski, S., Skuce, A. G., Green, S. A., Nuccitelli, D., Jacobs, P., Richardson, M., Winkler, B., Painting, R., & Rice., K. (2016). Consensus on consensus: A synthesis of consensus estimates on human-caused global warming. Environmental Research Letters 11(4). doi: 10.1088/1748-9326/11/4/048002 found that six independent, peer-reviewed studies about the extent of the scientific consensus about global warming reached similar conclusions: between 90% and 100% of climate scientists are convinced that human-caused global warming is happening. The most rigorous of these studies found that 97% of climate scientists are convinced that human-caused global warming is happening. Now, more than half of Americans (57%) understand most scientists agree that global warming is happening, the highest level since our surveys began in 2008, and a large increase (+24 percentage points) since the lowest level for this response in 2010. By contrast, one in four Americans (25%) think there is a lot of disagreement among scientists about whether or not global warming is happening, the lowest level since our surveys began. 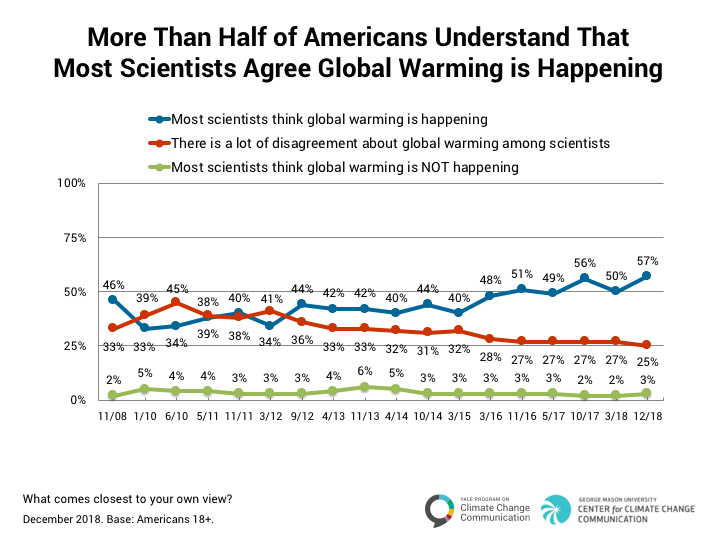 Very few Americans (3%) think most scientists agree that global warming is not happening. 1.5. Only one in five Americans understand that almost all climate scientists (more than 90%) have concluded human-caused global warming is happening. Although the majority of Americans now understand that most scientists think global warming is happening, fewer understand just how strong the level of consensus among scientists is. Only one in five Americans (20%) understand that nearly all climate scientists (more than 90%) are convinced that human-caused global warming is happening, an increase of five percentage points since our previous survey in March 2018. About the same proportion of Americans (22%) say they “don’t know” what percentage of climate scientists think human-caused climate change is happening, an eight point decrease since March.Respondents were asked to estimate the percentage of climate scientists who have concluded that human-caused global warming is happening by moving a simulated “slider bar” which appeared on the screen of their computer. This slider allowed respondents to move the marker from “0%” on the left to “100% on the right, or to any whole number between the two. A “don’t know” response option appeared below the slider bar.